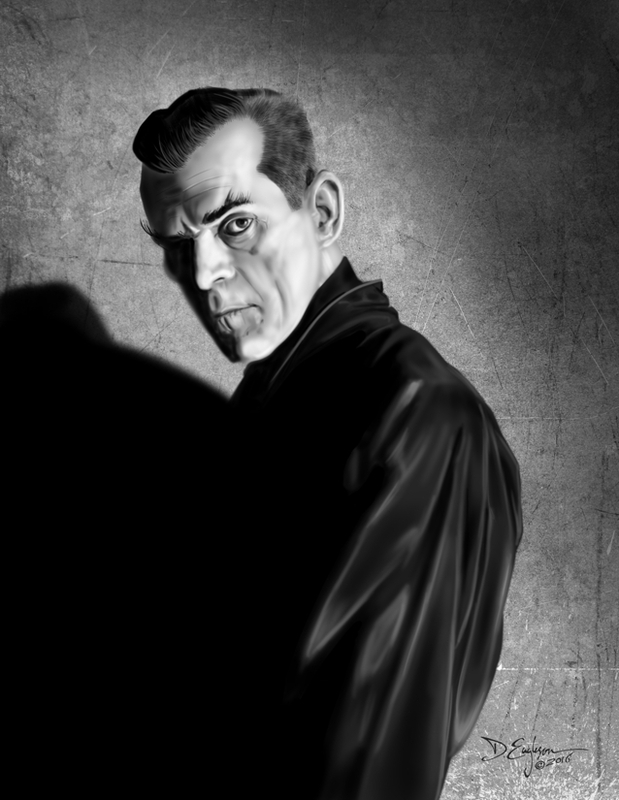 Continuing my Inktober celebration of horror film stars, herewith the inimitable Mr. Karloff. Boris Karloff is most famous, of course, for his first big role as the creature in James Whale’s 1931 Frankenstein. In choosing a source pic of him, though, I wanted to show him with a little less makeup – his craggy face is a fascinating character study. This shot came from one of my favorite films of his, The Black Cat, in which he co-starred with Bela Lugosi. The film has nothing to do with the Edgar Allan Poe short story of the same name (Lugosi would later appear in another Black Cat film, loosely based on the Poe tale, in 1943, with Basil Rathbone ). Karloff plays Hjalmar Poelzig, the leader of a Satanic cult, supposedly loosely based on Aliester Crowley. While not a great film, the Black Cat is notable for several reasons: this was one of the first films to pair Karloff and Lugosi together (they would work together on seven more films over the next six years, including The Raven and Black Friday); it’s one of the few films in which Lugosi plays a hero, rather than a villain; and it’s one of the first ever films to feature a musical soundtrack throughout. 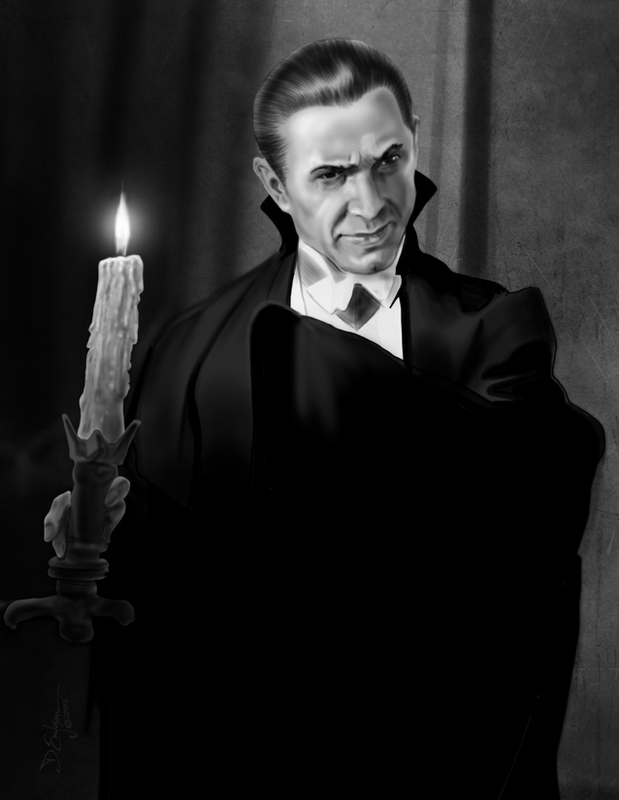 As with my Lugosi portrait, this one was created in Photoshop, using minimal layers and no effects (no selections, masks, adjustment layers, etc) except for a texture overlay on the background. When I was growing up, there were no VCRs or DVDs, no cable stations, Netflix, or On-Demand. We could only watch movies at home when the TV stations chose to air them. Frustrated by this, I got myself a reel-to-reel tape recorder, and recorded the soundtracks of my favorite movies when they aired, so I could play them back later. I listened to those tapes so often that I knew some of them by heart. I can still recite large sections of the script of Lugosi’s Dracula. The Black Cat was one of the ones I recorded. Toward the finale of that film, Karloff as Poelzig is conducting a black mass, and gives a grand sounding invocation in Latin. As a teenager, I memorized that Latin invocation, and recited it for my high school Latin teacher, who helped me translate it. It turned out to be a random assemblage of cliche adages (like “Take it with a grain of salt,” “Judge a tree by its fruit, not its leaves,” and so forth). Not exactly the sort of thing you’d expect would entice His Satanic Majesty into a personal appearance. Just after high school, a friend of mine was into LaVey Satanism. He had met those ghost chasers and “exorcists” Ed and Lorraine Warren (on whom the characters in The Conjuring were based), and they wanted to attend and tape one of his rituals. Being short on attendees, he asked me to join them, and do a piece in the ritual. I was an aspiring actor at the time, and did it as a lark. The joke is, the piece I did in that ritual was a Latin “invocation” I already had memorized — Karloff’s nonsense recital from The Black Cat. The Warrens duly taped the whole thing, and for years afterward, the tape of my sonorous recital of a bunch of Latin cliches was a feature of their lectures, presented as part of a legitimate “Satanic Ritual.” I’ve often wondered if there wasn’t ever a Latin scholar or a film buff in one of their audience who got the joke. So I’m late to the party with this “Inktober” business – just found out about it the other day. Choosing to jump in, I figured considering the time of year, I might as well make my Inktober creations celebrate some of my favorite horror stars. Bela Lugosi’s Dracula was the film that caught my imagination as a kid, and got me into horror to start with. Although I have a nostalgic fondness for it, and there are a few outstanding performances, the truth is, as a film, it’s not actually all that good. Director Todd Browning was apparently asleep at the wheel through most of it. He let Karl Freund cut loose with his camera work in the introductory scenes in Transylvania, which are the only scenes of any real cinematographic interest – once the action moves to England, Browning plants his camera in a medium shot, and barely moves it even to intercut any closeups, so it’s a lot like watching a stage play. In fact, the Spanish language version, filmed at night on the same sets by another crew, with Carlos Villarías as Dracula, is a much better version overall (though I think Villarías and Eduardo Arozamena in the roles of the Count and the Professor do not measure up to Lugosi’s and Van Sloan’s performances). All that said, Lugosi’s Dracula was certainly an iconic film which created a lot of what would become the standard tropes for horror movies, and kicked off Universal Pictures’ series of horror classics in the thirties. For the artists in the audience: Technically, my Lugosi isn’t “ink” per se. It was created in Photoshop, but I set myself certain rules to try to make it more like an actual ink piece: minimal number of layers, and no using selections or masks, no layer mode changes, no level adjustments, just painting with black and white. I broke my rules just once, putting a texture on on the background in multiply mode to give it a little more visual interest. pretty happy with how it came out. Much has been made of the fact that this book is the inspiraton for the CBS series Intelligence (and more power to John Dixon for it). However, be warned, Hollywood being what it is, Gabriel of Intelligence bears only a passing resemblance to Carl of Phoenix Isand. Not that they’re not recognizably related – the protagonist of Phoenix Island could easily have become the main character of Intelligence in a decade or so of living. But if this is a prequel (or Intelligence is a sequel), they take place in alternate realities. That said, Phoenix Island is well worth the read, whether you’re a fan of the show, or have never seen it. The book is a taut, well crafted action/adventure with touches of horror, that grips the reader (or gripped this reader, anyway) from the first page. Carl, the young protagonist, is the quiet badass orphan in his late teens, a bundle of fury in the boxing ring, who otherwise keeps himself to himself, and keeps his head down. However, injustices witnessed on a personal level bring that fury to the surface, and his reactions to such incidents bring his fighting skills and physical power into play, uncontrolled by any reason or judgement. Unsurprisngly, this tendency puts him into the hands of the law, and then into a reform school/juvie. The place he’s sent, however, is more than a little unorthodox, and to survive the place, he’ll have to learn to master himself. In that sense, Phoenix Island is a coming of age tale. It is not, however, a YA novel (though YA readers might well enjoy it). The action is nonstop, and well delivered. It’s clear Dixon is a boxer himself, and has an enthusiasm for the martial arts generally. He knows enough not to bog us down in elaborately clinical descriptions of a fight, but includes just enough tactical and strategic details to be absolutely convincing, hitting the important points hard, and letting the less important give and take glance off us. Anyone who has ever stepped into a ring or onto the dojo mats will recognize the authenticity of his descriptions. Myself, I’ve always been of the opinion that authenticity comes through, even for those who don’t have personal experience or knowledge of a particular subject. You don’t have to be an expert on Victorian history to recognize the difference between, say, a flashback episode of Dark Shadows and an episode of Masterpiece Theater. And you don’t have to have fired a pistol to intuitively pick up on the difference between a writer who knows his revolvers from his semi-automatics, and one who doesn’t. All other things being equal, authenticity communicates. You can’t help but like Dixon’s protagonist, even as you’re shaking your head at his youthful stupidities. And because he’s not, on the whole, a stupid kid, you know he’s going to have to get past those blind spots, and quickly. Dixon pits Carl against Stark, the warden of Phoenix Island, an older and more experienced antagonist, physically more powerful, with enormous resources at his back. This forces Carl not only to find some self control and self discipline, but also a new measure of cunning. His antagonist, and his situational disadvantages, will force Carl to take what he knows of tactics and strategy on the small scale (that of a fight in the ring, in the dojo, or on the street), and apply it to the larger picture (his long term conflict with Stark). There are a few of the usual prison/military tropes – the sadistic drill sargeant/guard, the fragile prisoner who breaks, the regular guy who gets offed – but Dixon injects each of them with his own unique flavor, and makes each seem less like a stale trope warmed over than a logical consequence of the situation (and the dreaded and inevitable Harmonica Scene is passed over qucikly, without use of an actual harmonica). 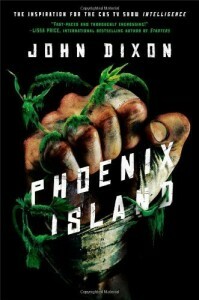 One of the great pleasures of Phoenix Island is the way it plays with the standard tropes of works like Cool Hand Luke and other prison/chain gang movies, mashed up with war stories, some Bond villain vibe, and a touch of The Hustler. One reviewer compared it to Cool Hand Luke by way of Lord of the Flies, and I wouldn’t argue too hard with that assessment. As you read Phoenix Island, it starts to feel familiar, and then takes a left hand turn. And keeps turning. Almost every time I thought I knew where he was going, Dixon threw me a curve ball. In the end, it seems to me that Phoenix Island celebrates that ultimate ability we have to choose, to draw lines for ourselves, to say “No!” to unfairness, injustice, intolerance and hate, and “Yes!” to compassion, companionship, and love, whether we’re boxing and martial arts stars, or just an unfortunate schmuck who ended up in the wrong place at the wrong time. Or both. Anyone who enjoys urban fantasy noir should immediately go pick up Dying Is My Business. 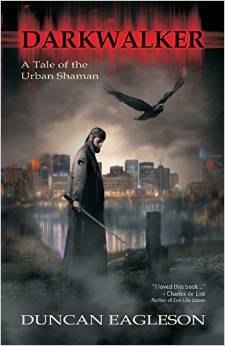 The promise of the title (a play on Chandler’s Trouble Is My Business) is well fulfilled, especially in the use of language – if Chandler or Hammett were alive today, and writing urban fantasy, it would probably sound something like this. Also, as a former New Yorker myself, I really appreciated the accurate depiction of the city. So many writers set stories in New York who have no idea, say, how long it takes to reach Columbus Circle from Fourteenth Street. It’s a pleasure to encounter a New York City story that makes it obvious the author knows the city well, and renders it in loving, if gritty, detail. Good work, Nick. 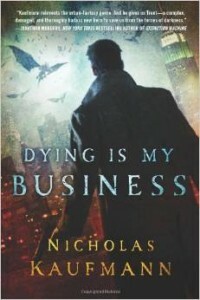 Looking forward to the sequel, Die and Stay Dead. Recently, I’ve caught a few episodes of the SyFy Channel’s Face-Off. I generally avoid “reailty TV” shows, as most of them seem predicated on embarrassing, humiliating, and generally abusing their contestants. This show, however, focuses on the creative process, and although the contestants are competing with each other, there’s more onscreen cooperation than rivalry. If you haven’t seen or heard of the show, it consists of a number of pro and semi-pro makeup artists competing each week to try and fulfill a certain assignment. Their finished makeups are the presented to a team of pro film character designers and makeup artists who judge them. Each episode, one design is chosen as the best, and the creator of the worst goes home. By the end of the season, it’s down to three or so, and the final winner gets all sorts of prize money and a car. The challenges consist of a variety of “weird” subjects, from the mythological and folkloric to the futuristic and science fictional. Usually there’s some sort of twist – a fairy tale character in a futuristic setting, a color scheme dictated by by a microscopic photograph, shapes dictated by a plant, and so on. The show follows various contestant’s process and progress from sketches to final makeup, usually involving a lot of sculpting and casting and painting of prosthetics along the way. Of course various contestants run into problems – a mold breaks, a prosthetic tears, a model is allergic to some material, a piece doesn’t fit right – any ambitious work that’s on a deadline will always develop last minute problems. Which is great for the show runners, because it provides the real tension and conflict, and that’s what holds peoples’ interest. As cool as it is to see the alien or monster gradually develop, understand some of the thinking, the why behind the designs, it’s even more fascinating to see the creative solutions these folks come up with to get around those surprise problems. Sometimes, the final result is actually the better for it, other times, not so much. It fascinates me that, slick and Hollywoody as Face-Off is, they don’t follow the usual reality TV approach to providing the most intense drama by pitting individuals against each other to provoke mayhem. Instead, they focus on the drama of the individual against time, circumstances, and materials, on the creative response to an unexpected challenge. On several episodes, one contestant’s disaster has drawn the others in to help them recover. Often there are assignments where they have to work in randomly assigned teams. While competition is the name of the game, rivalry is seldom seen. Contestants don’t act like selfish dicks – they generally behave like professionals in a professional setting. And the judges comments on the work are unflinching and honest, but never petty or demeaning. Dorky or graceful, brilliant or barely competent, all these people share a passion for their brand of creativity, and that’s what’s at the heart of this show. There’s a certain cheese factor to the show, sure. I think it’s in their corporate charter that more than eighty percent of the SyFy Channel’s original content must have a high cheese factor. They can’t depend on me tuning in every week – I have to budget my TV time, or I’ll fall behind on too many projects. But I’ll check it out from time to time, and probably catch the season finale. The show is worth a look. To make such a claim, however – that any such process is ever “complete” – is to court disaster (or at least embarrassment). 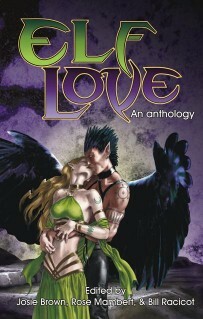 It looks to me like “small press” is quickly becoming a respectable term again. I admit it, I was one of those who, at one point, wouldn’t give a small press book even a cursory look. Which was probably silly even then, since a number of small presses that existed Back in the Day had certainly survived through the proliferation of the “small press” ebooks and PODs that made the term odious. 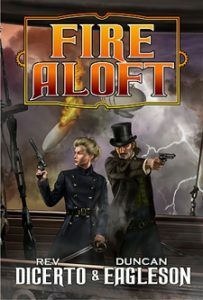 In any case, as was probably inevitable, the amateur fly-by-nights, aspirants to get-rich-quick-through-publishing, and self indulging vanity self publishers began to sink, while the small press folks who had a clue about things like editing, graphic design, and decent cover art began to swim, and rise to the top. Today, you can walk into Barnes and Noble and see small press books on their shelves that are indistinguishable from the what the Big New York Publishers are putting out. Small press and self-publishing are no longer fringe, they’ve moved into the mainstream. Just as Sturgeon’s law applies to regular Big Publishing product, it applies to the small and self publishers. There’s plenty of crapola in both camps. I admit, despite these intellectual realizations, my subconscious isn’t there yet. My first novel is out from a small press, and while part of me is elated about that, there’s also a part of my brain that won’t feel as if I’ve “arrived” until I’ve got a book in B&N published by one of the Big Guys. Don’t judge, okay? I know it’s irrational. 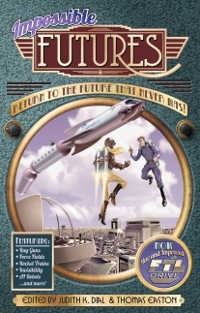 I grew up in an earlier time, and still love my hard copy books, too. In my youth, I thought a book was a physical thing. Now, it seems a conceptual thing – sometimes existing in a physical form, but always extending beyond the boundaries of that form into (for lack of a better term) the info-sphere. Of course, that was also always true, whether I realized it or not. Books have always existed in the minds of their writers and readers, as things which were only represented by that physical paper and board object. I find it interesting that e-books have brought this reality to our conscious attention. Yes, I’m a bit of a dinosaur. But even dinosaurs can learn, if they choose to pay attention. I won’t be using the words “just” or “but” any more when I speak of my book and my publisher. 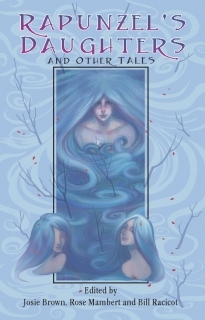 My first novel is out from Pink Narcissus Press, period. That’s plenty to be proud of.